Woohoo! Jess and I are headed down to the Galapagos islands in early June of 2015. 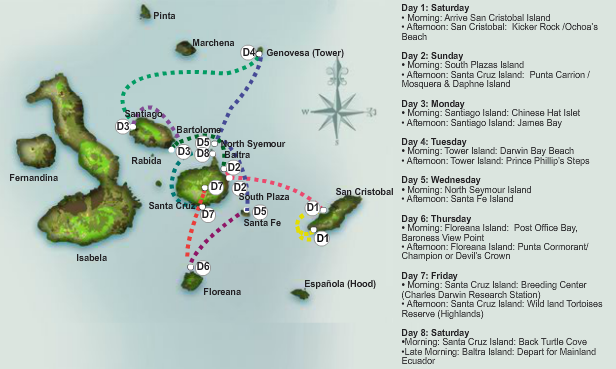 We’re cruising aboard the Quasar Evolution for 1 week around the older islands, when the dry season is getting started. Why the older islands and why June? Primarily due the promise I made Jess that we would celebrate our second anniversary, on June 7th, somewhere warm. As a side benefit, it turns out June plus the older islands combo could prove to be quite good for some above average Galapagos photography. Because the Galapagos islands are on the equator their two seasons are dependent upon ocean currents. The wet season is classified not just by an increase in rainy days, but by the Panama current dominating the islands with warmer waters. The warmer waters typically stir from January to May and create more precipitation than usual, but with sunnier skies….weird huh? From June to December colder waters make the air more temperate which leads to less precipitation. However, the moisture that does get into the air hangs around, so the dry season has cloudier days. Cloudy skies are better for getting stronger colors in photos. The dry season is actually kicked off when the sea life gets quite active due to the Humbolt current carrying Antarctic nutrients up to the islands. This creates algal and plankton blooms for the entire food chain to prosper. And what do animals do when food is abundant? They make babies! Yeah, there may be some photos of the Galapagos wildlife doing the bad thing hitting this blog in a few months, but there is another equation I’m talking about. Lots of food and hookup excitement makes for some very active animals. As wildlife is my favorite photography subject this is exactly the kind of Galapagos I want to shoot! We are going in a transitional period when we’re hoping to get a good variety of things. But there really isn’t a bad time to visit the Galapagos. And it goes without saying that we’re pretty f’n excited! The islands we will be visiting. The most Western island is still being formed by a volcano, so the more Easterly islands are older. Older islands have given life more time to acclimate… or in Galapagos terms: evolve. Previous Post What’s in the bag in 2014?